I went to movie inspiration for this year’s Halloween in our household. 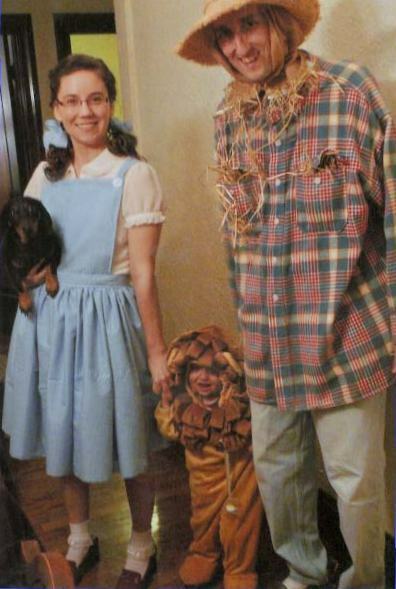 Except for missing the tin man, we were the four major characters from the movie The Wizard of Oz, and, in my opinion, did a smashing good attempt at re-creating those costumes. Toto might look a bit different, and our lion is too cute to be scary, but altogether, we made smiles from whoever saw us. 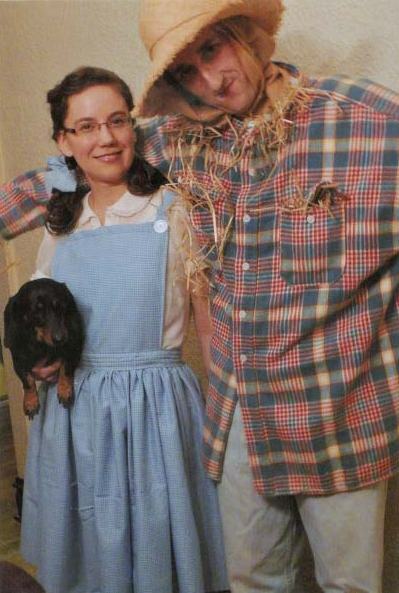 Now, just to clarify, I only sewed my outfit and the neck/head wrap for the scarecrow, my husband. Our little tyke’s outfit is from Target, hubby’s clothes are over-sized items from relatives, and my white blouse is a cheap but fancy resale shop purchase. In this post, I would mostly like to brag about my resourcefulness and creativity in coming up with my costume on such short notice. THE INSIDES: the only seam showing is the gathering at the inside of the waistband; all other seams are folds. I’ll explain the why and how of this down below. My stash has recently been expanded with the addition of several large containers of scraps and extra fabric from my parents’ AND grandparents’ houses. Most of these fabrics that I now have also have special connections to people, places, or events. Thus, when I ran across yards and yards of blue and white checked gingham cotton, I knew it would make the perfect “Dorothy” jumper. But, at the same time, I remembered it is also the same fabric used to make the curtains in my parents’ kitchen. I knew I wanted to make something quickly, preferably using no pattern, and sew an item that I really might use again. Yet, I really wanted to make it in a way so that I didn’t have to cut the cotton gingham at all, or at least minimally, just in case my mom should want to make some replacement kitchen curtains. So I made something that comes naturally to me – an apron! There was one big 8 yard piece and two separate pieces of gingham, each about 1 1/2 yards in length. One of the two smaller cuts was used for my bib by being kept folded, selvedge to selvedge, then folded some more into fourths and sewed down. The raw edges of the fabric were all at the one short end of my rectangular bib, so I cut off about 4 inches off that end. Now I had four long strips that got sewn into two shoulder straps, my waistband, and hair ties, while the bib was finally the right length to end at my waist. Next, I cut the large 8 yard piece in half to have two 4 yard parts. The gingham is a 45 in width fabric, and I know that half of 45 makes a good length skirt for me. With the fabric folded selvedge to selvedge again, I sewed a loose double zig zag stitch all the way across. It took QUITE some work to gather 4 yards this tightly. In a little over an hour the selvedge edge was gathered and sewn to the waistband, with a nice folded hem and double layered skirt for no show-through. I suppose I was following the engineer’s principle, K.I.S.S. (keep it simple, stupid), when my “Dorothy” skirt was in my mind. 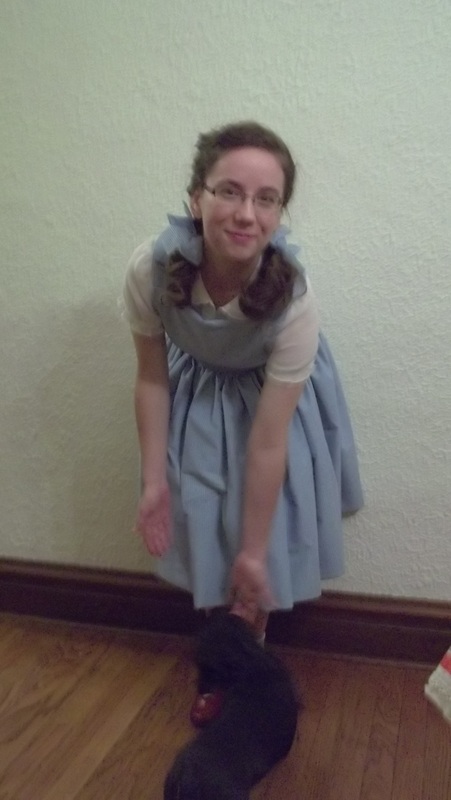 Notice how my “Dorothy” outfit goes all the way around me like a skirt, but ties in the back like an apron. The back skirt/apron center seam is kept together for now with a handful of safety pins. 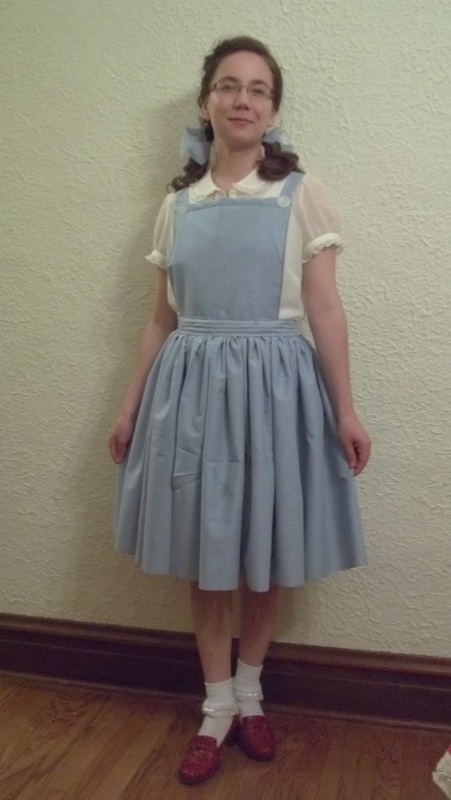 I think this might look quite good worn as an apron with a 50’s or 60’s dress, and I can even take it apart without too much grief if my mom needs my outfit take a second life as curtains. There sure was an element of surprise when my parents recognized the fabric of my “Dorothy” apron/dress on Halloween night. Hubby the “Scarecrow” had his head/neck covering from a small square cotton scrap found in the parental scrap tubs, as well. The back and the front were loosely gathered and the ends frayed a bit. I think my little creation, together with plenty of straw and his natural skinniness, makes the whole outfit work. There isn’t much to making this but…no pattern + I made it equals something I’m very proud of! It’s amazing how something as simple as fabric can link memories and people together. Making something with this gingham from my parent’s stash gives me a plethora of ideas to create things with many other fabrics that were a part of my childhood with my family. Do you have any fabrics or clothes that are connected to old memories which make you feel good inside? 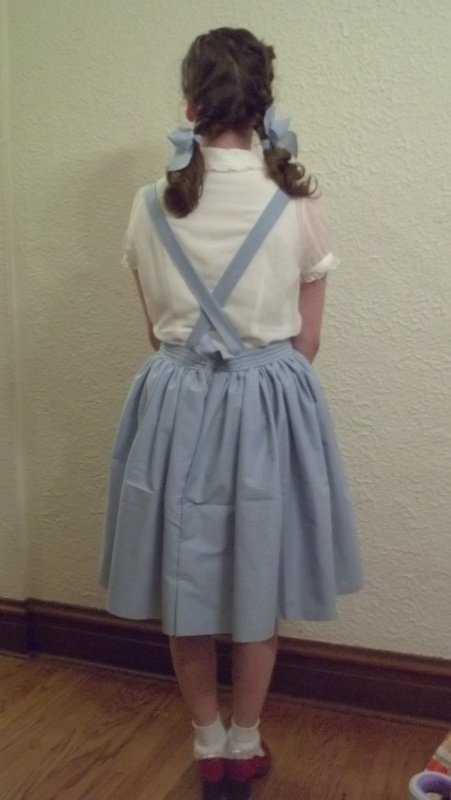 This entry was posted in Modern and tagged apron, costume, Dorothy Gale, gingham, Halloween, K.I.S.S., Wizard of Oz by kellycb. Bookmark the permalink.